Where do you get your substitute for Dollar Tree Foam Board? Yep. This is Ross brand foam board. I mostly use it for my builds. I think it is a little heavier. There have been several articles and posts on the differences between Ross and Adams. I just prefer the Ross myself. Awesome, we got a Super Walmart here in Western Kansas, will check for it. 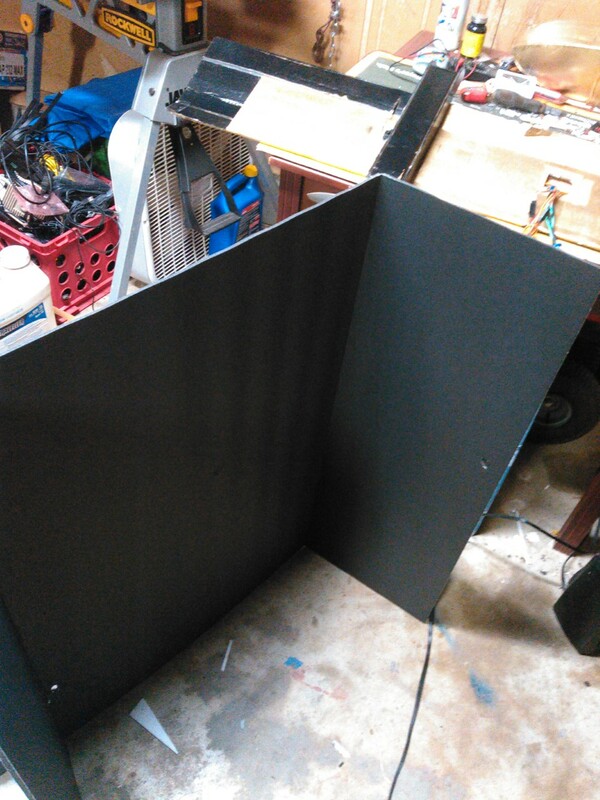 I do realize lots of folks like flat foam board, so if you have a Walmart handy, keep in mind you can buy online and have it shipped to the store for free (normally) and pick it up after arrival. Lots of store do this also, including the Dollar Tree store. dollar per sheet, not bad. I was recently on a business trip to Houston TX. I dropped into the Fry's electronics in Webster. They sell colored foam board. It isn't Adams, I can't remember the brand but it seemed light weight like Adams. Unfortunately I had no way to bring it home. Hotwire cutting foam planes is also a great option for those who don't have access to dtfb. I've also had good success using diamond cutting wire and a jigsaw. Works great for cutting Delta wings, flying wings, swept wings, and any form of tapered wings. 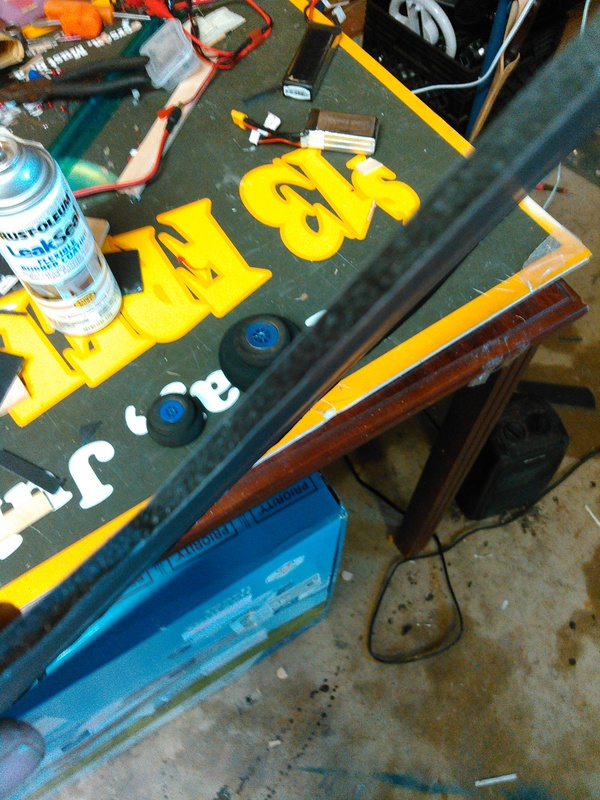 The method of cutting is extremely similar to using a hot wire fixed at one end and a single airfoil template, although the setup is a little more complex. 1. Attach one end of your cutting wire to a jigsaw (drill a hole in an old blunt blade). 2. attach the other end to a suitable spring to absorb the oscillations from the jigsaw. 3. Attach the other end of the spring to a length of paracord. 4. Have the paracord run over a pulley attached to the end of your workbench and off the end then attach a weight to the end of the cord. The weight & pulley provides a constant tension to the whole setup so that no matter where you position the jigsaw the tension on the wire remains exactly constant, the spring absorbs the oscillations of the jigsaw so the weight can remain stationary, and the jigsaw pulls the cutting line back & forth. Using this method you can cut thermoset foam such as PU which give off toxic fumes when attempted to be cut with a hot wire (which is pointless as it doesn't really melt in the first place) ...Kingspan, Celotex type construction foam. I can get offcuts of this stuff basically for free which is why I was looking for a way to make use of it. I also find I get a much better surface finish than with a hot wire as varying your speed during the cutting process has no ill effects. You can even stop half-way then continue later (as I found one time when my jigsaw battery went flat half-way around a leading edge). I have a habit of scouring online for foamboard, and recently found something I'm very fond of. 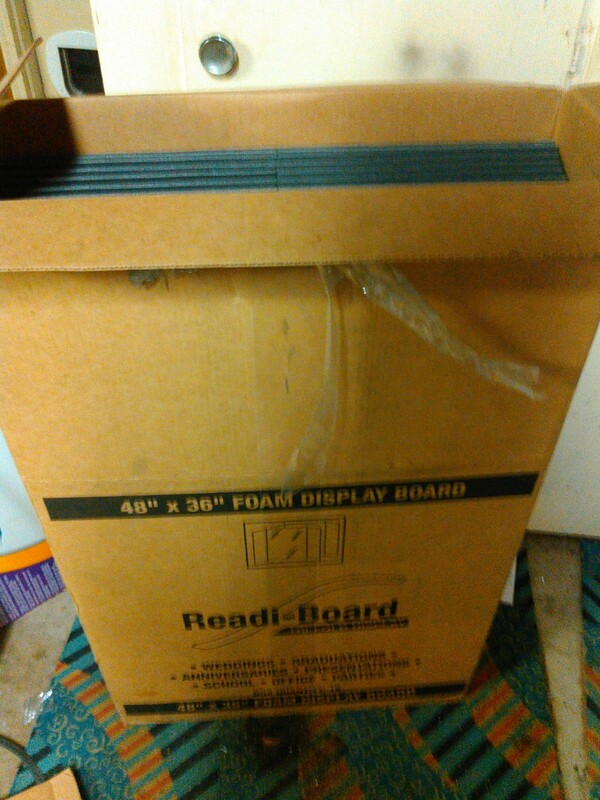 About 10 days ago I found a box of trifold Redi-board for $22 USD on Amazon prime (free shipping). I didn't pay much attention to the details since it was a good deal (18 trifolds for 1.23 a piece, they're 4.00 at dollar general). However when I received the box (in less than 36 hours no less) I noticed not only is the paper black, but the foam is black as well! I wasn't aware that this animal even existed! In my excitement I jumped on Amazon to order another case to find that it's out of stock and no other Amazon sellers have that product. I then contacted Adams requesting a reseller that might carry this sku#. The contact they gave me is for www.darice.com who appears to be a wholesale distributor for sign supplies. I submitted a request for availably and received an automated "we'll get back to you" email. I'll let everyone know what I find out. As a personal request, if anyone runs into these trifolds, reply back and let me know where you found them (unless you bought them all up). I've used several different brands of black board but these are by far the best I've seen. They're exactly as light as the white board and are actually easy to mark with pencil or a sharp white crayon. I'm going to start a FT Cruiser build this weekend (rain again) so I'll drop a pic on that so everyone can see what this board looks like on a build. Have a great week and keep the glue guns hot! I had a look at foam-board.co.uk, and this stuff looks like it might be good. My Dollar General caries Adams foam board, also known as Dollar Tree foam board. As others have said Ross foam board from Wal-Mart works well. With our local (and apparently every other) Shopko closing, I noticed display artwork on large sheets of foamboard. However, this is not the paper-sheeted board, it is plastic-sheeted (Styrene or similar). This will affect building practices a bit, as the sheeting is brittle to sharp bends. I posted another thread in the Workbench on what I have tried so far. I figure I paid less than half the price of DT foamboard for the lot. For the regular paper foamboard, we do have a store in town carrying it in various colors but it's another 50 cents over DT (100 miles away) and the latest batch appears to have a little curve to it (no reason that shouldn't flatten out in time or with a little effort). If Dollar General has any here, it's not the full 20"x30" sheets and any larger ones they do have are the folding presentation boards, much higher in price.